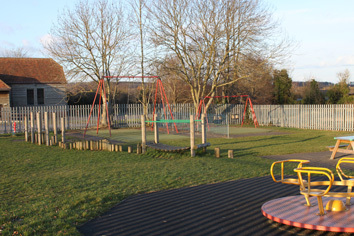 Goosecroft Recreation Ground provides the main formal sports areas for the village. It is accessed via Beech Road from the main A329 road, along a small lane call Goosecroft Lane. 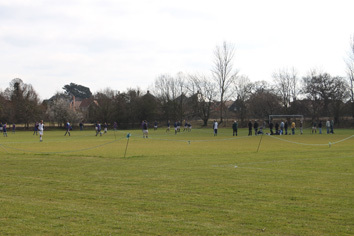 Goosecroft is the home for Purley Football Club, Purley Jubilee Football Club, Purley Cricket Club in their seasons, and also Purley Tennis Club all year round. 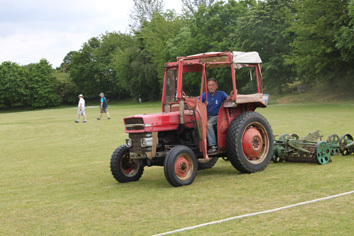 It is one of the best cricket fields in Berkshire, and hundreds of people use the combined facilities each month. Regular Farmers’ Markets and occasional Bank Holiday events are held at Goosecroft, as well as indoor events in the club and the Barn. There is a large car park for visitors to the facilities. There is a two-metre height restriction barrier in place at the entrance to Goosecroft – access for higher vehicle can be arranged via the Parish Office on either 0118 984 4507 or 07917 453187 between 8.00am and 6.00pm Monday to Friday and in an emergency only outside these times. Please contact us well in advance of your need for access. For the use of the Training Ground (Lower Goosecroft) please use the Booking Form, and contact the Amenities Officer at the Parish Office via email or directly (during public office hours). You will also need to complete a Risk Assessment Form. Both the forms can be completed electronically on your computer, then saved as a pdf to allow them to be emailed to the Amenities Manager. This is the preferred means of application. The main playing area, or Upper Goosecroft can be available, but the booking arrangements differ depending upon the season. In winter, use the same booking form and contact the Amenities Officer as above. In summer, the use of the ground is controlled by the Cricket Club, and any booking should be made via their officers. The Cricket Club contact details can be found on their website www.purleyonthamescc.co.uk/.